There is no doubt that this is a high stakes election. It is not Tweedledum and Tweedledee, as former Alabama Gov. George Wallace famously said of the major parties when he ran as a third-party candidate nearly a half century ago. Almost everyone nowadays agrees that a Donald Trump presidency would take the nation in a vastly different direction than a Hillary Clinton presidency. Yet their political destiny is not totally in their own hands. This is an election where third and fourth parties can shape the outcome. And in an historical sense, that is highly unusual. Third parties, such as Ralph Nader’s Green Party candidacy in 2000, tend to affect presidential elections every decade or two. But not since Ross Perot’s campaigns in the 1990s has the third-party vote reached 10%, nor since 1948 have four parties (two majors plus two minors) won at least 2% of the popular vote. With Libertarian Gary Johnson and Green Party nominee Jill Stein, both could happen again this year. Polls show Johnson well above the 2% mark and Stein hovering right around it. Meanwhile, a fifth candidate, independent Evan McMullin started too late to be a factor in the nationwide popular vote, but is making a play for the electoral votes of his home state of Utah. There have been 47 presidential elections held since 1828, the first year there was a nationwide popular vote pitting candidates from two major parties. Of all these elections, just 10 featured candidates from four parties that drew at least 1% of the total vote. Most of the contests were clustered in a six-decade period from the eve of the Civil War (1860) to World War I (1916), when the Prohibition and Socialist parties were in their heyday. In addition, only four presidential elections involved four candidates that received at least 2% of the total vote, which are highlighted below in orange. This year’s election could be the fifth of that genre. Notes: An asterisk (*) indicates an incumbent president. The abbreviation “Const. Union” stands for the Constitutional Union Party; “Prog.” for Progressive Party; “So. Dem.” for Southern Democratic Party; “St. R. Dem.” for the States’ Rights Democratic Party. The 1836 election is not included: While it featured four candidates who won at least 2% of the vote, three of them were Whigs. The Whig Party used a regional candidate strategy to try to deny Democrat Martin Van Buren a majority in the Electoral College, but it failed. Source: Congressional Quarterly’s Guide to U.S. Elections (CQ Press). Four-party presidential elections seldom happen. Such contests, with four parties reaching the seemingly modest 2% level, have happened only four times since 1828 — in 1860, 1892, 1912, and 1948. On three of these occasions, there was a common denominator: The party holding the White House split asunder. On the eve of the Civil War, the ruling Democrats could not agree on a single ticket and fielded different ones in the North and the South. A pro-Union third party materialized as well, opening the door wide for Republican Abraham Lincoln to win the 1860 election with just 39.8% of the vote. The GOP would not lose the White House again for nearly a quarter century. In 1912, it was the reigning Republicans who split in two, which was as much a personal grudge match as an ideological reckoning. President William Howard Taft and former President Theodore Roosevelt battled through the Republican primaries and then on through the general election. Roosevelt, leading the breakaway Progressive Party (known colloquially as the Bull Moose Party), drew more popular and electoral votes than the Republican standard-bearer, Taft. But with the GOP vote split, Democrat Woodrow Wilson won more of both than either, and was easily elected president with 41.8% of the vote. The Socialists were the fourth party in the 1912 race, taking their highest share of the vote ever (6.0%). In 1948, it was the Democrats once again that divided, with two third parties flaking off from either side — a Southern-oriented States’ Rights Democratic Party (the Dixiecrats) on the right and a new-era Progressive Party on the left. For much of the campaign, Democratic President Harry S. Truman looked like a goner. But he was able to rally the core of the party in the fall to dispatch his heavily favored Republican opponent, Thomas E. Dewey, with 49.5% of the vote. In 1892, the other presidential election where four parties drew at least 2% of the vote, none of the major parties was seriously divided. Rather, a short-lived third party, the Populists, took 8.5% of the vote, while a longer-running third party, the Prohibitionists, took 2.2%. 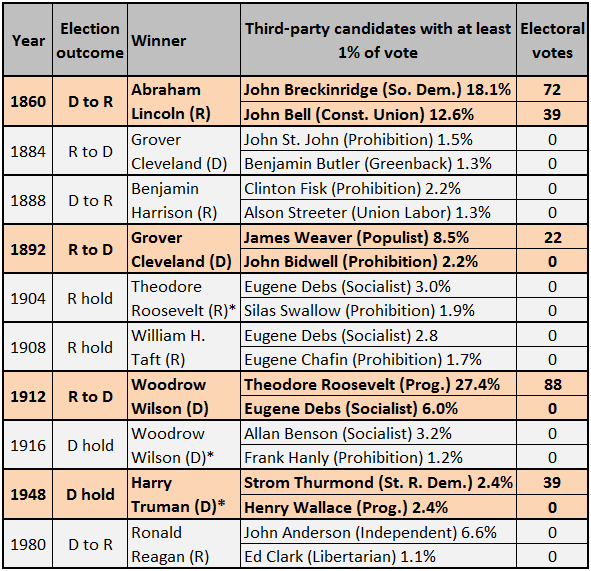 In a close election, the White House flipped from Republican to Democrat, with Grover Cleveland winning a second non-consecutive term with 46.0% of the vote. A major reason why the 2016 election is shaping up as a four-party race is the unpopularity of Clinton and Trump, leaving plenty of voters to look for options outside the two major parties. As a consequence, Johnson, Stein, and to some degree, McMullin, are gaining far more media attention than third parties normally do. The Libertarians, in particular, are making the most of it. Johnson has won a number of major newspaper endorsements, including the Chicago Tribune, The Detroit News, the New Hampshire Union Leader, and the Richmond Times-Dispatch. His individual endorsements range from the entertainment world (The Price Is Right host Drew Carey) to the political world (retiring Republican Rep. Scott Rigell of Virginia), to whatever world is in between (exemplified by former professional wrestler and ex-Minnesota Gov. Jesse Ventura). Adding to their viability is that both Johnson and Stein have cleared the often difficult hurdle for third parties of ballot access. Johnson is on the ballot everywhere — in all 50 states and the District of Columbia. Stein is on the ballot in 44 states and the District. And the Libertarians have earned “street cred” with a ticket that features two former Republican governors, Johnson of New Mexico and vice presidential nominee William Weld of Massachusetts. Some think that the party would be doing even better this year if the ticket were reversed, with Weld atop the ticket. But in the world of Libertarian politics, that was impossible. Both Johnson and Stein were the standard-bearers of their parties in 2012, with Johnson winning a Libertarian Party record in excess of one and a quarter million votes and Stein taking slightly less than 500,000 on the Green line. Both are poised to do much better in 2016. 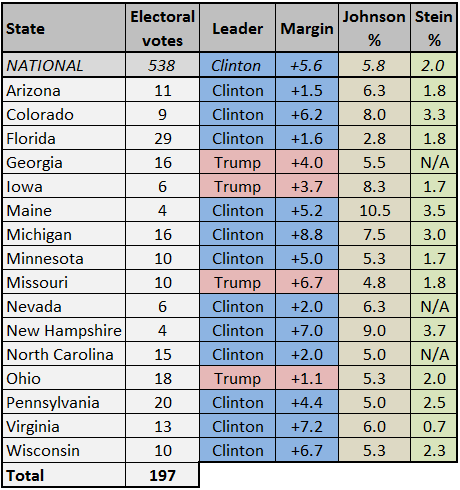 Late October polls show Johnson drawing roughly 4% to 8% of the national vote and Stein about 1% to 3%. The former, in particular, is already set to be the balance of power in many closely contested battleground states. RealClearPolitics is tracking the presidential race in 16 battleground states. As of Oct. 26, the poll share for Libertarian nominee Gary Johnson is larger than the lead enjoyed by either Democrat Hillary Clinton or Republican Donald Trump in the vast majority of them. Add in the share for Green Party nominee Jill Stein, and the combined Johnson-Stein percentage exceeds the lead for Clinton or Trump in every battleground state except Missouri and Virginia. The current list of battleground states does not include Texas and Utah, where the Republican grip is considered to be weakening. In the latter, independent Evan McMullin, is making a play for the electoral votes of his home state. Note: Green Party nominee Jill Stein is not listed on the ballot in Georgia, Nevada, or North Carolina. Source: RealClearPolitics as of Oct. 26, 2016. The Libertarians with Gary Johnson and the Green Party with Jill Stein are the third parties most likely to influence the 2016 presidential election. 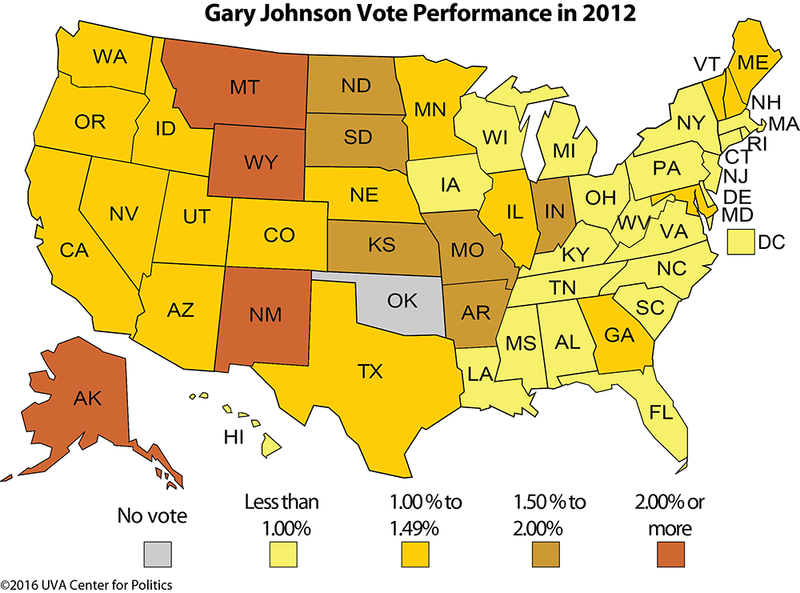 Johnson will appear on the ballot everywhere — in all 50 states and the District of Columbia. Stein will be on the ballot in 44 states and the District, but not the battleground states of Georgia, Nevada, and North Carolina. Evan McMullin is probably the most notable independent in the race, but his late-starting candidacy (he did not announce until August) made it on only 11 state ballots. Map 1 lays out the states where they are on the ballot. Notes: Green Party nominee Jill Stein is an official write-in candidate in Georgia, Indiana, and North Carolina. Evan McMullin either already has or is expected to have official write-in status in 32 states. Among other third parties, the Constitution Party will appear on 24 state ballots, the Reform/Delta Party on 20 state ballots. In both instances, the District of Columbia is counted as a state. Source: The October 2016 issue of Ballot Access News, published by Richard Winger. Both Libertarian Gary Johnson and Green Party nominee Jill Stein are expected to draw far more votes next month than they did in 2012, which was the first time they were on the general election ballot for president. Neither had much impact on the presidential race four years ago, although Johnson received more total votes than any Libertarian presidential candidate ever had in the four decades of the party’s existence, and the second largest percentage. 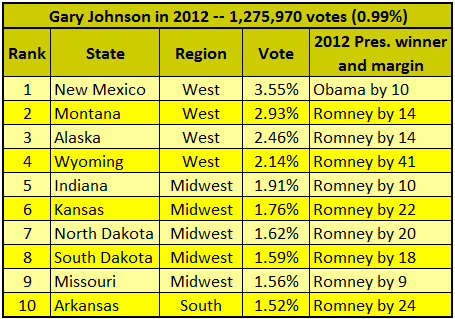 Johnson tended to run best in smaller states of the rural Midwest and the Mountain West, nearly all with a Republican orientation. 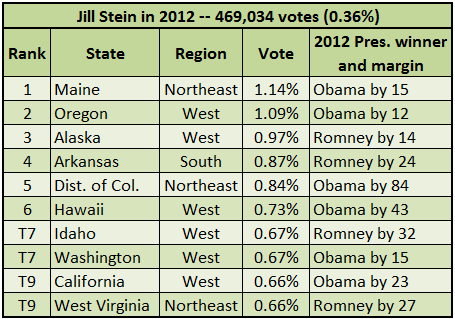 Stein’s leading states (as they were) tended to be in the Northeast and the West, and were more politically eclectic. Note: For this tally, the District of Columbia is included as a state. Source: America Votes 30 (CQ Press, an imprint of SAGE Publications). The $64,000 question is, which major party will this year’s third parties hurt the most? With its progressive bent, the Green Party will almost certainly take votes out of the Democrats’ hide. Stein was trolling for the votes of former Bernie Sanders supporters in Philadelphia at the time of the Democratic National Convention and has been particularly harsh in her criticism of Clinton. Whom the Johnson-Weld ticket might hurt is less clear. Libertarianism emphasizes small government, which plays wells on the right, and also a modest defensive-oriented and more isolationist national defense, which tends to play well on the left. And the party favors a hefty dose of individual rights, with government out of both the gun closet and the bedroom. That plays well on both sides of the political spectrum. Polls have shown Johnson running best among independents and young voters (who often have weaker party loyalty than older voters). And historically, the party’s presidential candidate has often run best in the West. A reasonable goal for the Libertarians this year is to take 5% of the national vote. Under federal campaign finance law, that could win the party’s presidential nominee millions of dollars for his or her 2020 campaign. Yet often, third parties fade as Election Day approaches, succumbing to the “wasted vote” argument and often lacking the money to make a rebuttal or mount any sort of ground game. But given the unpopularity of Clinton and Trump, that late third-party swoon may not develop this year. Significant third parties have managed to affect the outcome over the years by winning enough votes to flip a critical state or two from one major party to the other. That happened in 2000, when Green Party nominee Ralph Nader took nearly 100,000 votes in Florida, a state where Republican George W. Bush emerged the certified winner over Democrat Al Gore by just 537 votes. To this day, many Democrats maintain that Nader cost them the election, as Bush’s national margin of victory was only five electoral votes. Third parties that can actually win electoral votes have been few and far between. Those that have are often regionally focused. In 1948, for instance, South Carolina Gov. Strom Thurmond’s Southern-centric States’ Rights Democratic Party drew only 2.4% of the overall vote but carried four states across the Deep South and won 39 electoral votes. In 1968, Wallace’s American Independent Party ran a more national campaign than Thurmond and took 13.5% of the nationwide vote. Wallace’s base, though, was also the South, where he won five states and 46 electoral votes. No third-party candidate since then has won an electoral vote, a number that includes Ross Perot. The wealthy Texan ran as an independent in 1992 and captured 18.9% of the vote. His cross-country appeal was impressive, as he won at least 20% of the vote in 28 states (including California, Massachusetts, Ohio, and Texas), at least 25% in eight of these states, and 30% in one (Maine). Yet Perot failed to win a single state or a single electoral vote. 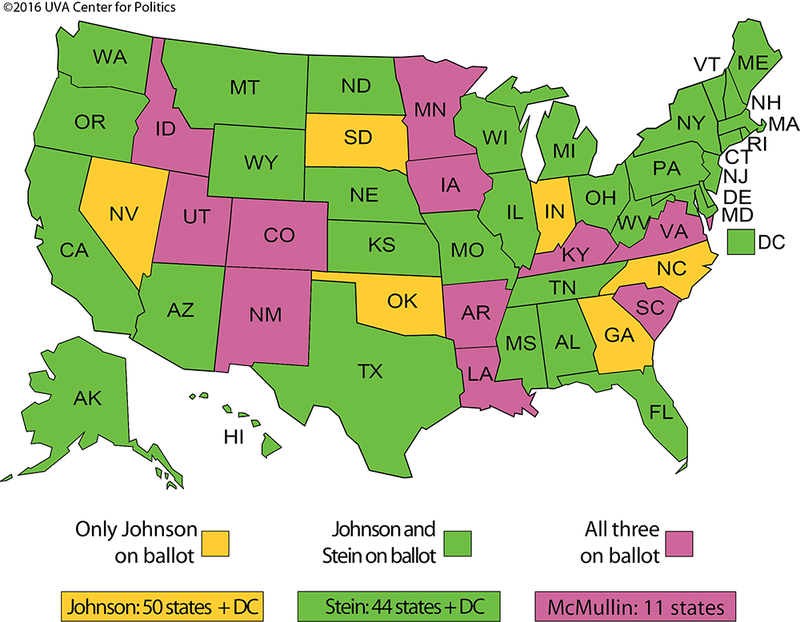 Ironically, the third-party candidate most likely to win electoral votes in 2016 is not Johnson or Stein, but McMullin. His late-starting candidacy — he entered the race in August — made it onto only 11 state ballots. But one of them is his home state of Utah, where he has been focusing his effort. McMullin is a Provo-born graduate of Brigham Young University who possesses a Republican pedigree. He is running as a personally “civil,” conservative alternative to Trump. The Republican nominee did not fare well in Mormon Utah’s Republican caucuses earlier this year, and has shed GOP backing in the Beehive State since then. The result is that bright red Utah is in play with a mid-October Emerson College poll showing McMullin in the lead with 31%, Trump with 27%, and Clinton with 24%. If McMullin manages to be elected “president of Utah,” he will earn six electoral votes. The ultimate question, though, may be whether this election will be a transformative one that realigns the presidential landscape. In the recent past, third parties have had a hand in abetting that process. In 1968, Wallace acted as a way station for Southern whites making their way from the Democratic to Republican parties. In short order, the South went from being a Democratic bastion to a cornerstone of the GOP — first at the presidential level, then at all levels of government. Perot was a major player in the 1992 election, when Democrat Bill Clinton defeated Republican incumbent George H.W. Bush. Clinton launched the current era in which Democrats have won the popular vote in five of the last six presidential elections. The key part of the shift: The movement of large numbers of suburban voters from Republican to Democrat. This year, there are already signs of a possible realignment in the making, with Trump bringing large swaths of working-class whites to the Republican side, while driving college-educated whites into the arms of the Democrats. In short, this election may help bring about shifts in the electorate that will affect the nation’s political landscape for years to come. It would not be the first time in our nation’s history that a four-party election provided the backdrop for significant change. This could be the first presidential election in 20 years where the tally for third-party candidates reaches 10% of the total vote. It has happened only nine times before, most recently in the 1990s when Ross Perot ran first as an independent (1992) and then as the Reform Party nominee (1996). The highest third-party vote share came in 1912, when 35% of all ballots cast in the presidential race were for third parties. 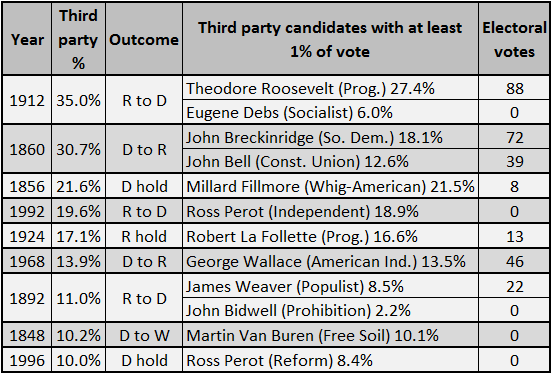 Most went for former President Theodore Roosevelt, whose 27% share on the Progressive Party line that year was the highest percentage ever received by a third-party or independent presidential candidate. Notes: The third-party vote percentage includes ballots cast for independent candidates and write-ins. “W” stands for Whig in the Outcome section. The abbreviation “American Ind.” stands for the American Independent Party; “Const. Union” stands for the Constitutional Union Party; “Prog.” for Progressive Party; “So. Dem.” for Southern Democratic Party. 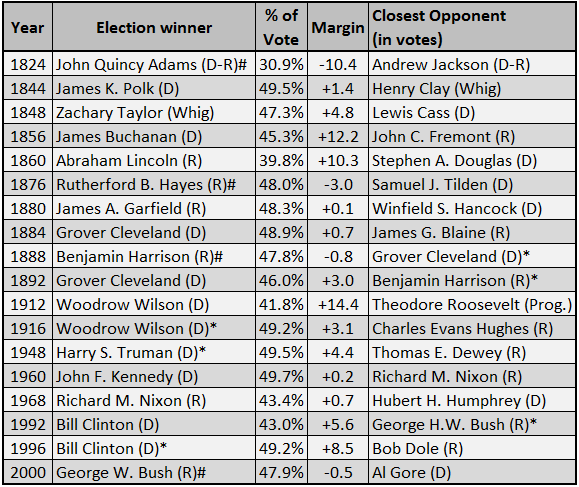 Over nearly two centuries of popular voting for president, the winner has triumphed with less than 50% of the vote in more than one out of every three elections (18 altogether). This year could produce the 19th sub-50% winner, with the prospect that third-party candidates will siphon off roughly 10% of the vote. Some of the nation’s “minority” presidents are among the best known. Grover Cleveland, Woodrow Wilson, and Bill Clinton were twice elected to the White House with less than a majority of the vote. Meanwhile, Republican Abraham Lincoln won a four-way election in 1860 with less than 40% of the vote, the lowest winning percentage for any president since the two-party system became a permanent part of the political landscape in the late 1820s. Notes: A pound sign (#) indicates that the presidential winners in 1824, 1876, 1888, and 2000 were popular vote losers. An asterisk (*) denotes an incumbent president. The abbreviation “D-R” stands for Democratic-Republican Party; “Prog.” for Progressive Party. In 1824, all the major candidates represented the Democratic-Republican Party.